Akit's Complaint Department: New Clipper Vending Machines for BART? Can't They Just Retrofit? New Clipper Vending Machines for BART? Can't They Just Retrofit? It turns out the Associated Press decided to go national with a brief story about BART going nuts over the Clipper card program (via San Jose Mercury). One item caught my eye today, it says that by March of 2011, every BART station will have Clipper vending machines to add funds to their cards. Since the AP article didn't give much about these machines, Streetsblog SF got some more info and said it will be new machines. I originally thought when BART stations was going to be able to add Clipper value, they were going to retrofit the existing ticketing machines to do that job. But... new ones? Why should the MTC waste their money on installing new machines? They could just retrofit the BART ticketing machines to handle it. The machinery is already there, it takes bills, coins, credit cards, and has a round sensor where it can read and write to RFID cards. What makes this more strange, the BART ticketing machines are from CUBIC! Yes, the same company that's maintaining and operating Clipper. The existing equipment is there, it just needs a software update and possibly some other minor physical upgrades (including sticker signage). If BART stations needs to have machines to issue new Clipper cards for those who don't have one, buy one of those mass produced telephone card vending machines. 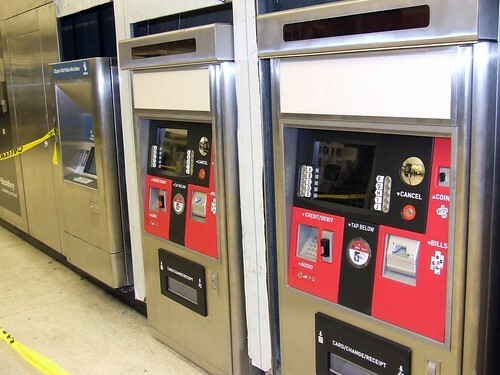 The PATH system on the East Coast has telephone card vending machines selling pre-funded Smartlink cards and their ticketing machines can only add value. If there's a MTC, Clipper, or BART representative out there, will it be new machines or retrofitting the existing BART ticketing machines?